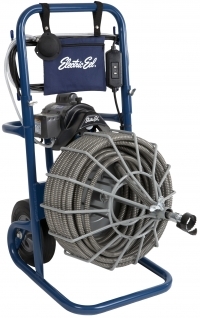 The Model R Drain Cleaning Machine from Electric Eel features a Flex Leader and an extra heavy-duty frame constructed of 1-1/4" steel tubing. The 12" Flex Leader helps negotiate bends and traps, and is now standard with the Model R Tool Set. The unit is designed to clean 3" - 6" diameter lines up to 100 feet with the unique TRI-MAX inner core cable -- the toughest cable in the industry -- available in 5/8" and 3/4" diameters. The Model R is powered by a heavy-duty 1/3 H.P. capacitor Baldor motor and utilizes easy "snap-lock" tool connectors. Belt Guard makes maintenance and repair faster and easier. This compact and rugged machine is ideal in situations with limited work space.